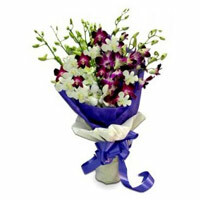 Send Flowers to Mumbai, Online Flowers Delivery in Mumbai, Orchids Bouquet. Send Flowers in Mumbai.Mumbai Online Gifts presents various types of fresh Orchids Flower to Mumbai. For online Flowers delivery to Mumbai, place an order with Mumbai Online Gifts. ORCHIDS : Exotic and graceful, orchids have always symbolized love, beauty and strength. Pink: The pink Orchid has the honour of representing innocence, femininity, grace, joy and happiness. It also represents the celebration of wedding anniversary. Purple: Purple flowers often represent royalty, respect, admiration and dignity and the same is true for purple orchids. Orchids Flowers are the best flowers gifts to send your mother on mother"s day and any ocasion related to mother.